Black History Month: educational resources. * features an extensive resource page for teachers and school counselors. "Rosa Parks, the "mother of the civil rights movement" was one of the most important citizens of the 20th century. Mrs. Parks was a seamstress in Montgomery, Alabama when, in December of 1955, she refused to give up her seat on a city bus to a white passenger. The bus driver had her arrested. She was tried and convicted of violating a local ordinance. Her act sparked a citywide boycott of the bus system by blacks that lasted more than a year. The boycott raised an unknown clergyman named Martin Luther King, Jr., to national prominence and resulted in the U.S. Supreme Court decision outlawing segregation on city buses..."
"The students in Mrs. Taverna's second grade class at Pocantico Hills School in Sleepy Hollow, New York have been learning about Harriet Tubman and the Underground Railroad. We read about Harriet. We wrote about Harriet. Mrs. Taverna and Mrs. Hongell, (our computer teacher), helped us write this web site to share with other children. We created a timeline, we wrote a QUIZ, we wrote some character sketches, we wrote poems about Harriet and we even made some crossword puzzles about Harriet Tubman for you to work on. We hope you enjoy it. Putting the Movement Back into Civil Rights Teaching provides lessons and articles for K-12 educators on how to go beyond a heroes approach to the Civil Rights Movement. 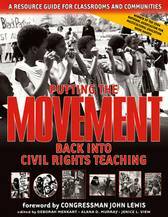 The book includes interactive and interdisciplinary lessons, readings, writings, photographs, graphics, and interviews, with sections on education, labor, citizenship, culture, and reflections on teaching about the Civil Rights Movement.